With a stay at Hotel Grand Chancellor Melbourne, you'll be centrally located in Melbourne, just a 3-minute walk from Her Majesty's Theatre and 7 minutes by foot from Princess Theatre. This 4-star hotel is 0.4 mi (0.6 km) from Melbourne Central and 0.4 mi (0.7 km) from Bourke Street Mall. Make yourself at home in one of the 160 air-conditioned rooms featuring minibars and LCD televisions. Complimentary wireless Internet access keeps you connected, and satellite programming is available for your entertainment. Bathrooms have designer toiletries and hair dryers. Conveniences include phones, as well as desks and complimentary newspapers. Don't miss out on recreational opportunities including an outdoor pool and a fitness center. Additional features at this hotel include complimentary wireless Internet access, concierge services, and babysitting/childcare (surcharge). Grab a bite at Footlights, one of the hotel's 2 restaurants, or stay in and take advantage of the 24-hour room service. Quench your thirst with your favorite drink at the bar/lounge. Buffet breakfasts are available daily from 6:30 AM to 10 AM for a fee. Featured amenities include a business center, limo/town car service, and express check-in. Planning an event in Melbourne? This hotel has facilities measuring 5382 square feet (500 square meters), including a conference center. Self parking (subject to charges) is available onsite. 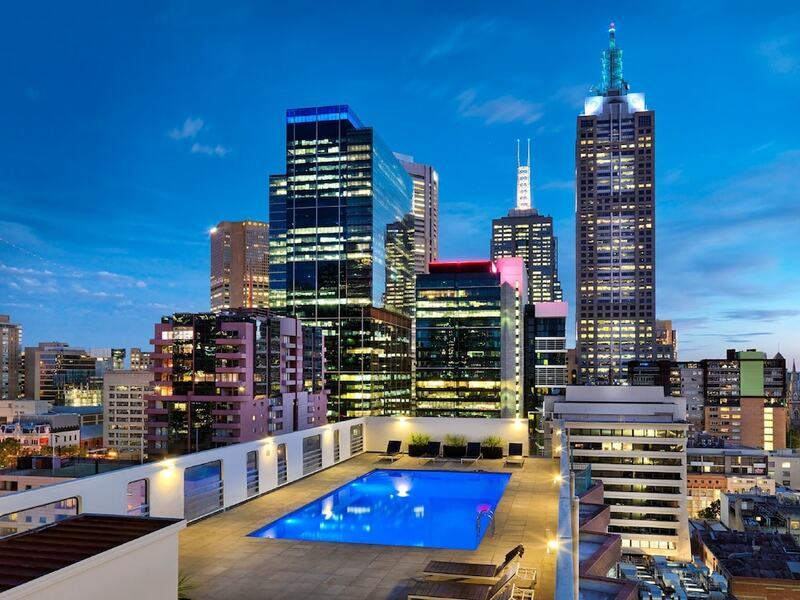 Hotel Grand Chancellor Melbourne features an outdoor pool and a fitness center. Dining is available at one of the hotel's 2 restaurants. A bar/lounge is on site where guests can unwind with a drink. A computer station is located on site and wireless Internet access is complimentary. This 4-star property offers access to a business center and limo/town car service. Event facilities measuring 5382 square feet (500 square meters) include a conference center. This family-friendly hotel also offers a rooftop terrace, tour/ticket assistance, and multilingual staff. Limited onsite parking is available on a first-come, first-served basis (surcharge). Hotel Grand Chancellor Melbourne is a smoke-free property. Footlights - This restaurant serves breakfast only. Encore Cafe and Bar - This restaurant specializes in local cuisine and serves dinner only. Guests can enjoy drinks at the bar. A children's menu is available. Happy hour is offered. Reservations are required.